Synthetic peptide corresponding to Human CtIP. Jurkat and MCF-7 cell lysates; Jurkat cells. This antibody was developed as part of a collaboration between Epitomics, the National Cancer Institute's Center for Cancer Research and the lab of Andre Nussenzweig. View antibodies from NCI Center for Cancer Research Collaboration. Our Abpromise guarantee covers the use of ab155988 in the following tested applications. WB 1/1000 - 1/10000. Predicted molecular weight: 101 kDa. Is unsuitable for ICC,IHC-P or IP. Endonuclease that cooperates with the MRE11-RAD50-NBN (MRN) complex in processing meiotic and mitotic double-strand breaks (DSBs) by ensuring both resection and intrachromosomal association of the broken ends. Functions downstream of the MRN complex and ATM, promotes ATR activation and its recruitment to DSBs in the S/G2 phase facilitating the generation of ssDNA. Component of the BRCA1-RBBP8 complex that regulates CHEK1 activation and controls cell cycle G2/M checkpoints on DNA damage. Promotes microhomology-mediated alternative end joining (A-NHEJ) during class-switch recombination and plays an essential role in chromosomal translocations. Genetic variability in RBBP8 is noted as a factor in BRCA1-associated breast cancer risk (PubMed:21799032). Exhibits sensitivity to tamoxifen in certain breast cancer cell lines (PubMed:18171986). Belongs to the COM1/SAE2/CtIP family. The PXDLS motif binds to a cleft in CtBP proteins. The damage-recruitment motif is required for DNA binding and translocation to sites of DNA damage. Acetylated. 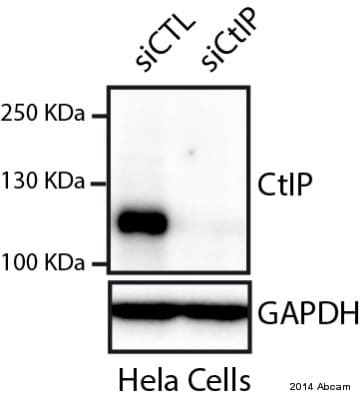 Deacetylation by SIRT6 upon DNA damage promotes DNA end resection. Hyperphosphorylation upon ionizing radiation results in dissociation from BRCA1. Phosphorylation at Thr-847 by CDK1 is essential for the recruitment to DNA and the DNA repair function. Phosphorylated on Ser-327 as cells enter G2 phase. This phosphorylation is required for binding BRCA1 and for the G2/M DNA damage transition checkpoint control. Ubiquitinated (PubMed:14654780, PubMed:16818604). Ubiquitination at multiple sites by BRCA1 (via its N-terminal RING domain) does not lead to its proteosomal degradation but instead the ubiquitinated RBBP8 binds to chromatin following DNA damage and may play a role in G2/M checkpoint control (PubMed:16818604). Ubiquitinated by RNF138 at its N-terminus (PubMed:26502057). Nucleus. Chromosome. Associates with sites of DNA damage in S/G2 phase (PubMed:10764811). Ubiquitinated RBBP8 binds to chromatin following DNA damage (PubMed:16818604). Flow Cytometric analysis of permeabilized Jurkat cells labeling CtIP with ab155988 at 1/100 dilution (red) compared to a rabbit IgG negative control (green). Publishing research using ab155988? Please let us know so that we can cite the reference in this datasheet.